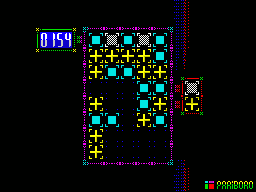 For all you still waiting for a Civilization-like game to come out on Spectrum, here's a little treat from Andrew771, who also made ZXOOM long ago. Here, you can download Russian and English versions and the source code. Dead By Dawn is a new 3D adventure game heavily inspired after the cult movie called Evil Dead 2: playing as Bruce Charcoal, you need to find twelve pages of a spellbook so you could seal the evil you've accidentally unleashed back. The controls may be a bit unorthodox, so here's a rundown of the game complete with the author's description, controls list and download links. To make things quick, you can download the original pack or Goodboy's disk version. 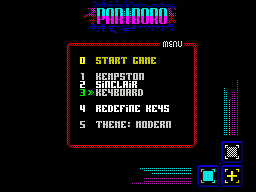 Okay, here's a new platform game from England, which is completely unorthodox to anything you may have played on Spectrum before. It's controlled with only two buttons (spacebar for jumping and M for changing direction), it's full of traps, it's pretty hard to beat the clock or your own record (although that depends on what difficulty you choose). 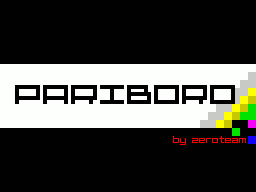 A new game from Zeroteam (Slovakia) was released recently. Its' gameplay resembles Lines: you need to find a requested combination of two blocks on the field so it could be cleared out. Clearing out the entire row on the field will bring you more new blocks. 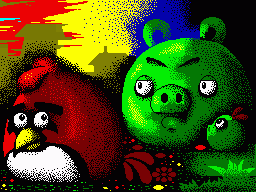 You can download either the original .tap flie or tiboh's TR-DOS adaptation. Carlos Michelis, a new game from Argentina, stuffed with action, adrenaline, puzzles and cutscenes, is now finally out for sale, after being presented on Next Castle Party 2012. Among other features, it also includes multiple languages and a fully-working 48K support. 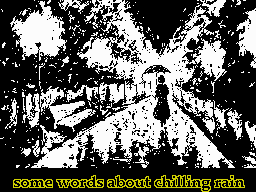 If you don't know if the game's still worth buying it, a one-level demo of the game can be downloaded here. 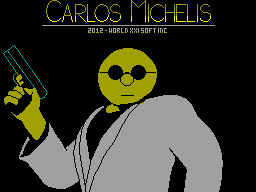 In fact, according to Ariel Ruiz himself, a physical TR-DOS version of Carlos Michelis, complete with instruction booklet, is to be available for sale sooner or later! You can also visit the game's official site. Acid Paper is back in action. All the truth about some of the habitants of zx-pk.ru and what could have been if a prequel of Alien, Prometheus, would be remade, plus a lot of other interesting stuff. Don't hesitate to read it now! With the best wishes from nix./site, moroz1999, riskej, sq/skrju, mikezt/zeroteam, Mick, VNN/KCS and AAA, we bring this little gift to a just married couple: Eugeny and Kate! Next Castle Party 2012 Voting Begins NOW! 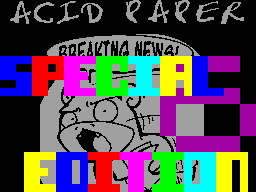 Be prepared to vote for ZX Spectrum prods at Next Castle Party 2012, because it will be about two hours before all the games, the pictures and the music will be revealed to the public and available for voting! Everyone outside the partyplace is given a right to vote, but for no more than two extra hours. You do the math for your own timezone. Stay tuned for the updates so you would know the location of the votesheet.